EMT Basic practice scenarios can be a great help in preparing for the EMT-B certification. You are likely to be nervous when your EMT Basic certification is just next week or sooner. Having an idea of what might the exam be reduces your nervousness and anxiety and makes you more relaxed and confident. Practice scenarios will also help you improve and be much better prepared, have more control and familiarity by giving you a glimpse of what to expect in the actual examination. In simple terms, EMT Basic practice scenarios are hypothetical situations used in practical training designed for EMT Basic level. These practice scenarios will let you experiment and apply your EMT-B skills so will be prepared when you encounter the same or similar situation in the field. The most immediate use of EMT-B practice scenarios is in helping you pass the EMT Basic practical examination. The scenarios are also used in a way to increase your practical experience of the throughout the EMT training course. Some scenarios can be completed by one person like patient assessment, while in other scenarios the student will give instructions as team leader to coordinate other team members. The scenarios should become more challenging as you progress. There some important things to remember when you doing EMT-B practice scenarios. You should verbalize your actions to let those watching understand your assessment and treatment. Some of the things you should verbalize are safety of the scene, you have taken proper body substance isolation (BSI) precautions, decision to wait for ALS backup or transport, and those which cannot or unlikely to be seen like many assessment steps and looking for specific signs. By verbalizing you’ll be given proper credit and they also help organize your thoughts. You must do the scenarios as you would in the field including talking to the patient. You will be given a time limit which may vary and instructors may change or make the scenarios as realistic as possible to better meet the student’s need and make it more challenging. You should assess and treat the patient according to instructions and vital signs should be taken. Scenarios roles may be assigned for bystanders/family, patient, lead provider, assistant provider, and others . Patient Assessment: Perform a thorough physical assessment for both Trauma and Medical patients in an organized and comprehensive way. It is also important to develop patient rapport and obtain a comprehensive history. Also remember your SAMPLE and OPQRST mnemonics. Cardiac Arrest Managment / EAD: Rapidly do an initial assessment, apply CPR, quickly, safely, and effectively administer a defibrillator shock, prepare patient transport, consider ALS intercept. Spinal Immobilization: Apply proper technique in using extrication collar for Supine Patient and Seated Patient, and securing the patient to a long board. Breathing Emergencies: Adequately ventilate using a bag-valve-mask device for Bag-Valve-Mask Apneic Patient and adequately ventilate a patient using a pocket mask with an oxygen port and one-way valve for Mouth-to-Mask with Supplemental Oxygen. Upper Airway Adjuncts and Suction: Measure the appropriate size and insert the nasopharyngeal airway and correctly suction an oropharynx. Musculoskeletal Injuries: Properly immobilize a closed, non-angulated long bone fracture of a Long Bone Injury, properly immobilize an isolated shoulder injury by applying a sling and swathe of a Joint Injury, and proper method of applying a Traction Splint. Supplemental Oxygen Administration: Set up a free flow oxygen delivery system and deliver oxygen at a specified rate. Soft Tissue Injury: Properly care for a patient with an amputated or avulsed body part. Emergency Childbirth: Safely and effectively deliver a full term infant. Your textbook should have some EMT-B scenarios. 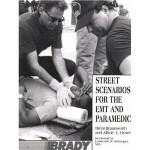 There are also EMT books like EMS Scenarios and Street Scenarios for EMT and Paramedic. You can also visit the scenarios section of EMTLife Forum and the EMTB.com site. You can also check your local health facility that offer EMT training courses and meet up with friends or other students to share scenarios and ideas. Although real life emergencies may differ from EMT Basic practice scenarios, it is necessary for EMTs to practice and be prepared when emergency comes. So practice more as it definitely helps when evaluation comes.